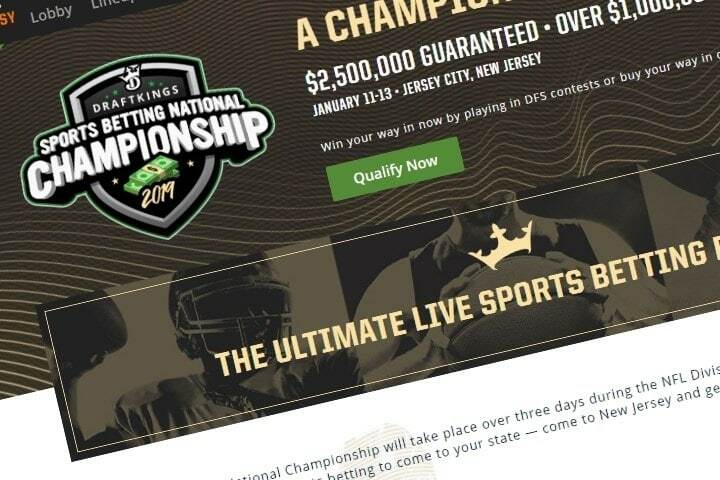 Now DK is changing the game — or at least changing the type of field it’s played on — by announcing the 2019 Sports Betting National Championship. At 6:17 p.m. ET this past Friday, a time typically reserved for a “news dump” of information intended to get buried amidst the transition from workweek to weekend, DK sent its customers an email announcing this historic upcoming live final that amplifies the crossover from daily fantasy to sports betting. That adds up to $2.45 million in guaranteed prizes, but that’s not all the money at stake, because competitors will have 5,000 actual dollars to bet with, and they keep whatever they end up with. So assuming the average finalist is a break-even bettor (not the safest assumption, factoring in vig) and assuming a field of 531 entrants, that’s another $2.655 million in the pot. Between the expected value per player of the guaranteed prize pool ($4,614 in a 531-player field) and that $5,000 of gambling money, plus two-night hotel stay and whatever else makes up the “VIP Experience,” it’s basically a fair proposition for the $10,000 buy-in. In the event that there are more than 531 entries, the guaranteed prize pool will pivot upward from its $2.45 million starting point. There is a 1,000 player cap on entries. Which brings us to the ways to enter: You can either buy in for $10K, straight up, WSOP Main Event style, or you can qualify via DraftKings DFS satellite, with entries starting as low as 10 cents (but good luck running that gauntlet from 10 cents to $10,000). As for the competition, there are three days of betting, you pick the games/props/amounts, with certain restrictions: You have to place a minimum of $1,000 in bets by the close of betting on Saturday night (1 a.m. ET), and on Sunday you can only bet on the two NFL divisional playoff games and you must bet at least $2,000 across those games. If you don’t bet those minimum amounts, well, you can still keep whatever’s in your bankroll, but you won’t qualify for the leaderboard and the guaranteed prizes. The winners are determined exactly as you’d expect: by who’s built the biggest bankroll from that $5K starting point by the end of business Sunday. DraftKings is straddling some fences here. As has been the case since DK Sportsbook went live in August, the company has one foot in DFS and one in sports betting, and is combining them here by running qualifiers via DFS. Any folks who want a “sports betting national championship” to be a pure sports betting competition might be inclined to take issue with this. DK is also walking the line between, to put it in poker terms, tournament chips and cash. In poker, tournament chips have no cash value. For this event, tournament dollars equal real dollars. This adds a bizarre strategic angle to the proceedings. If you got in on a qualifier and you’re thrilled to have turned some small dollar amount into $5K, you might choose to bet nothing. You can also make a longshot underdog bet on Friday or Saturday for the $1K minimum, then play for first place on Sunday if it hits or else keep your $4K and go home. You might even be able to run your $5K up into $15K or $20K through Saturday night, but determine that you’re way behind the leaders and the right move is to sit out Sunday and take home your tidy profit. On the flip side, a popular strategic move for those playing for first place might be to bet your whole $5K on Friday, risking an early bustout in order to build a ‘roll. Much like with blackjack tournaments, the Sports Betting National Championship takes a form of gambling we all understand and completely changes the approach to playing it. There’s a lot to like here: DraftKings is getting creative, the company is presenting a visible live event that the media outlets in New Jersey (and nationally) will be inclined to cover, and entrants are getting fair value if they buy in for $10K. But there are also elements not to like. Competitors are at the mercy of the odds presented by DraftKings the weekend of January 11-13, and if DK wants to jack up the vig a little bit across the board, there’s nothing contestants can do to get around it. Also, as noted above, qualifying via DFS arguably waters down the sports-betting purity of the event. Additionally, though there’s a one-entry-per-person limit, sports betting “sharps” often come in teams, and if a team of numerous entrants applies a variety of different strategies in order to build a big bankroll, that makes it harder for true single-entry contestants to win the $1 million grand prize. We won’t know for sure what works and what doesn’t, and whether this innovation can be deemed a success, until it’s over. But what we can assess now is what this says about DraftKings’ plans in the U.S. sports betting market. It says DK wants to make sports betting about more than just sports betting. It says it wants to lend prestige and glamour to an industry often associated with degenerate gamblers, much the way the WSOP did for poker. It says DK wants to enhance the social element of sports betting while attaching more human faces to it. And it says DK is trying to make a splash. Being the first to launch in the NJ mobile space started that, and it’s continuing with the company’s planned expansion in Nevada. Now DraftKings — despite the odd timing of the news dump — is seeking mainstream attention with a first-of-its-kind live event. DK isn’t sitting on its bankroll, happy to take home a small profit. The company is playing to win.